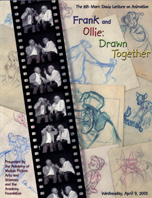 Marc Davis, the Disney animator and imagineer, with his wife Alice, set up the Marc Lecture series at the Academy of Motion Pictures Arts and Sciences in 1994. It's purpose is to provide a forum for animators to share their experiences and to explore challenges of the future. 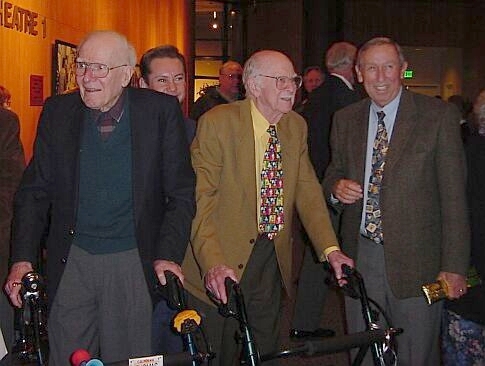 On April 9th, 2003, at the Academy's Samuel Goldwyn Theater, the eighth in this series, honored Frank & Ollie in a program titled “Frank & Ollie, Drawn Together”. The praise was effusive, and the evening glittered. The event was sold out, and animators filled the audience and the stage. See a larger image of the lecture flier. 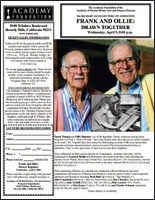 See a larger image of the program cover. In the Mark Twain classic, “Tom Sawyer”, Tom and Huck, after rafting on the river, sneak back into town, only to attend their own funeral. Frank was asked the next day what he thought of the evening. He pondered for a moment and with a twinkle in his eye, he quipped, “Now I know how Tom Sawyer felt."